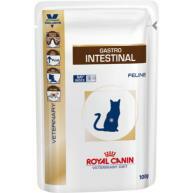 ROYAL CANIN British Shorthair Adult In Gravy Wet Cat Food is both scrummy and nutritious! ROYAL CANIN British Shorthair Adult in Gravy is specially formulated with all the nutritional needs of your British Shorthair cat in mind. The British Shorthair typically has a sturdy, heavy and muscular body. 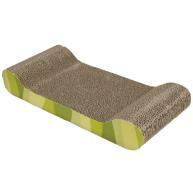 As a naturally solid and powerful cat, your cat’s weight should primarily derive from muscle instead of fat. Therefore, the right nutrients (as well as correct portion sizes) are essential. 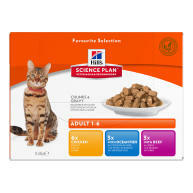 ROYAL CANIN British Shorthair Adult in Gravy contains a moderate energy level and an adapted fat content (3.2%) for effective weight management. 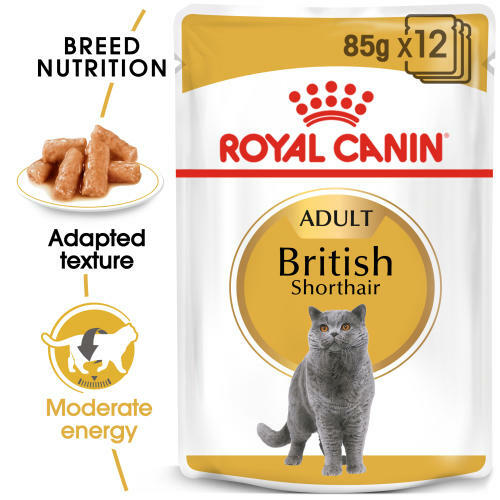 ROYAL CANIN British Shorthair Adult in Gravy contains a specific balance of nutrients, including a variety of vitamins, to not only maintain a healthy and well-nourished coat, but also to support and maintain healthy skin. To cater to each cat’s individual preferences, ROYAL CANIN British Shorthair Adult is also available as dry food, with crunchy and tasty kibbles. If you’re considering mixed feeding, simply follow our feeding guidelines to ensure your cat gets an accurate amount of both wet and dry food for optimal benefit. Moderate energy - Adapted fat content for effective weight management. 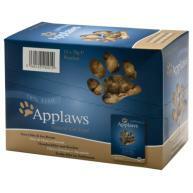 Healthy skin and coat - Helps maintain skin and coat health. Additives: Vitamin D3: 260 IU, E1 (Iron): 8 mg, E2 (Iodine): 0.33 mg, E4 (Copper): 2.6 mg, E5 (Manganese): 2.5 mg, E6 (Zinc): 25 mg. Composition: Meat and animal derivatives, cereals, fi sh and fi sh derivatives, vegetable protein extracts, oils and fats, derivatives of vegetable origin, minerals, various sugars. Crude ash: 1.2%. Crude fibre: 0.8%. Crude oil fats: 3.2%. Moisture: 81%. Protein: 9%.